This article is based upon doctoral research conducted by the JRC (G. Fulli) and Politecnico di Torino (F. Profumo, E. Bompard) - for more info click on the PhD thesis cover page on the right and go at the bottom of this page. Energy is crucial for the mankind and must be provided when and where needed to avoid serious hazards to societies. Energy security, which has to do with the energy system's capability to deliver energy to the users, represents a crucial concern for policy decision making at all levels. Energy security occupies a prominent place in most of the EU's energy policy action areas: supply security is one the five mutually reinforcing dimensions of the EU's Energy Union strategy; the proposal for a European Energy Security Strategy includes short and long-term energy security measures targeting critical energy infrastructure; the EU internal energy market is expected to be integrated and resilient; the promotion of energy efficiency and domestic energy production, would foster the reduction of energy import dependency. Among all forms of energy, electricity seems bound to play an increasingly central role, particularly in Europe. More and more shares of EU's energy are expected to be converted into electricity, particularly in the transport, heating and services demand sectors. Depending on the scenarios, the electricity in the EU’s final energy consumption - which roughly represented one fifth in 2012 - is anticipated to grow from one fourth in 2030 to one third or above in 2050. Hence, the growing need for procuring, providing and securing electricity deserves careful consideration. Electricity security refers to the power system's ability to continuously fulfill its function against possible adverse situations (of techno-economic, geo-political etc. nature). 1. What is electricity security? 2. What models are used for electricity security analysis? 3. Who are the main electricity security actors? 4. How electricity security decision making currently works? 5. How to improve electricity security decision making? Electricity security can be defined as the power system's capability to withstand disturbances - i.e. events or incidents producing abnormal system conditions -, or contingencies - i.e. failures or outages of system components - with minimum acceptable service disruption. In the following, having in mind the above reported definition, we identify some electricity properties security in relation to threats, possibly materialising into adverse events, occurring in different dimensions (not necessarily internal to the power system) and at different time and spatial scales. Power system can be vulnerable to threats that, when materialised, may cause foreseeable and unforeseeable disruption. Within the energy system, the power system faces several security threats - natural, accidental, malicious, as well as linked with emerging low-carbon systemic changes. The threats potentially affecting electricity security can be characterised in terms of impact areas, time duration, internal or external provenance, intrinsic nature (natural, accidental, malicious and systemic). Four overarching dimensions of electricity security can be identified, and they can be visualised as the physical or virtual corridors across which the electricity commodity/service has to travel to reach the users: an infrastructure dimension, a source dimension, a regulation and market dimension, a geopolitical dimension. In the infrastructure dimension, electricity security is assessed in terms of the power system (i.e. the electricity value chain) capability to supply end users with minimum service standards/criteria. In the source dimension, electricity security is assessed in terms of the energy system capability to ensure the accessibility, in the various timeframes, to primary sources to be converted in the power plants to meet the required total demand of electricity. In the regulation and market dimension, electricity security is assessed in terms of the power system and market capability to adequately fulfil their electricity delivery mission with a set of laws, rules, market arrangements and price schemes. In the geopolitical dimension, electricity security is assessed in terms of the energy/power system capability to assure the availability of primary sources and/or cross-border electricity exchanges in case of economic or geopolitical constraints/stresses (e.g. unilateral primary energy cut by international players outside the considered region). Operational security is the ability of the power system to maintain or to regain an acceptable state of operational condition after disturbances. It covers dynamic issues and real-time network management issues. Flexibility is the capability of the power system to cope with the short/mid-term variability of generation (like renewable energy) and demand so that the system is kept in balance. Adequacy is the ability of the power system to supply the aggregate electrical demand at all times under normal operating conditions. It generally includes:a generation/storage adequacy component, a transmission network/import adequacy component, distribution network and end user adequacy components,a market adequacy component. Resilience is the mid-term capability of the power system to absorb the effects of a disruption and recover a certain performance level. Robustness is the long-term capability of the power system to cope with constraints/stresses originating outside the infrastructure dimension. 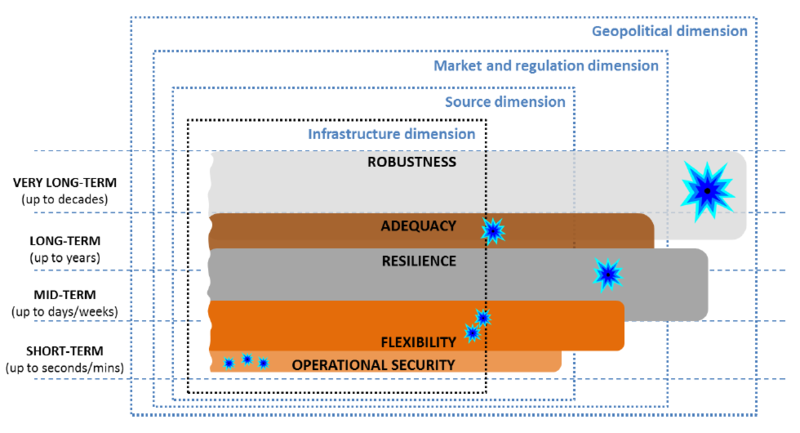 Electricity security can be mainly characterised via operational security, flexibility and adequacy, with special reference to the internal electricity value chain challenges and constraints. Electricity security can be mainly described in terms of robustness and resilience in the event of pressures originating outside the electricity system. 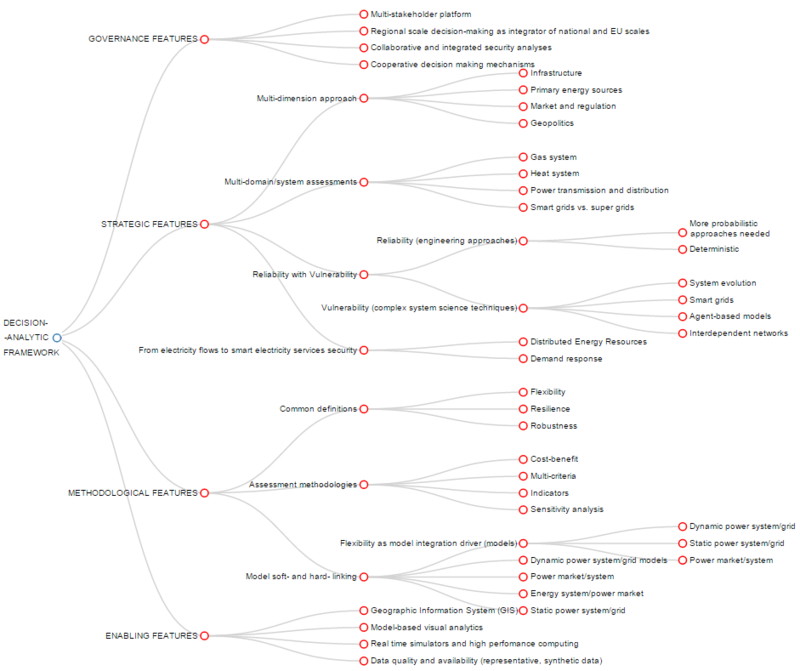 To sum it up (see the electricity security properties mind map below), electricity security is a multiple-aspect issue, namely: a multi-threat, multi-scale & dimension, multi-property, multi-stakeholder & discipline, multi-problem, multi-model & approach, multi-action issue. a multi-threat problem. Electricity security is challenged by threats of natural, accidental, malicious and systemic nature. a multi-time scale problem. Various time frames (short-term, mid-term, long term and very long term) shall be considered due to the inherently different electricity security challenges, system performances and actions which can be put in place. a multi-spatial scale problem. Electricity security has both local and far-reaching features, for the sake of our research on electricity transmission security classified in the EU, regional and national scale. a multi-dimension problem. The threats materialise in adverse events surfacing in different dimensions: from the infrastructure to the primary energy sources dimension, from the market and regulation to the geopolitical dimension. a multi-disciplinary problem. Electricity security analysts are interested in observing, assessing and valuing electricity security from different perspectives, with different disciplines and in different fields (political, strategic, economic, regulatory, scientific, technical, etc.). a multi-stakeholder problem. Numerous and diversified electricity security players (policy decision makers, regulators, system operators, etc.) interact in different fields, spatial scales and time frames of the electricity security problem. Table 10 describes the main responsibilities towards electricity security of existing (EU and national) and emerging (regional) actors. both a complicated and complex problem. Depending from the angle one looks at it, electricity security can "just" be a complicated problem - the electricity grid is often defined as the most complicated man-made machinery ruled by nonlinear equations - or a complex problem, where very diverse actors interact in different layers (component, communication, information, function and business) and whose collective behaviour can be hardly described by any set of equations. a multi-faceted problem. Electricity security properties can be broken down into operational security, flexibility, adequacy, resilience and robustness. a multi-model problem. Several model clusters are deployed: dynamic power system/grid models, static power system/grid models, power market/system models, energy system/power market models. a multi-action problem. Decision makers can indeed deploy several actions to prevent, mitigate and respond to security threats. The main role is played by the TSO which, depending on the time scale, can resort to operational actions, operational planning and scheduling actions, system planning actions and (partly) strategic energy planning actions to safeguard electricity security. As suggested above, a great variety of methods and models are employed to assess electricity security. This depends on several factors including: the policy maker’s requests, the researcher's background, the characteristics of the system/phenomenon under observation. The dynamic power system/grid models provide a detailed short-term description of the power system, grid and protection components. They mainly target the infrastructure dimension of electricity security, i.e. they model as endogenous factors and variables included in the electricity value chain. The typical time horizon is up to seconds (minutes) and the time steps are in the order of milliseconds or even microseconds. The dynamic power system/grid models necessarily embed a static model of the power system/grid (described in the next section). The static power system/grid models offer detailed representations of the power grid (component by component). The static power system/grid models mainly target as endogenous the infrastructure-related electricity security dimension (some elements of the primary energy sources dimension might be included). The typical time horizon is one or several years. The time steps largely vary depending on the very different models within this cluster (power flow, topological, graph-based, etc): they might not even be specified (when studying system snapshots or topological features) or they could typically be hours or fractions of hours. The power market/system models generally represent the demand-supply equilibrium, and might use simplified assumptions for describing the grid ("single node" or more detailed representations). They mainly consider as endogenous factors within the infrastructure and the primary energy source dimensions of electricity security, as well as some aspects of the market and regulation dimension. The typical time horizon is up to one year (or several years) and the typical time steps are hours/weeks (or weeks/months). The energy system/power market models represent the whole energy system and selected portions of the power system/market. They target the source and the market and regulation dimensions of electricity security (the latter, as well as the geopolitical dimension, may be exogenous to the model). The typical time horizon is up to years or decades and the typical time steps (named also time slices) are weeks/months (i.e. a few tens per year). Afterward, electricity security assessment approaches - tackling operational security, flexibility, adequacy, resilience and robustness - were assessed and mapped to the model clusters. Reliability approaches (addressing operational security, flexibility and adequacy), focusing on the ability of the system to perform its intended function. Vulnerability approaches (addressing the lack of resilience and robustness), focusing on the inability of the system to withstand strains and on the effects of the consequent failures. Solutions for integrated analyses, like those based upon cost-benefit analyses, multi-criteria analyses and indicators, were also analysed. 3.Who are the main electricity security actors? An increasingly diversified number of actors is involved and affected by the energy system transition and has a stake in the energy and electricity security issues: policy decision makers and operators, regulators, market operators, generation companies, asset owners, aggregators, manufacturers, consumers, emerging actors (offering new services and/or proposing new business models), all play a role in the security of supply problem definition and solution. Each EU Member State is still largely in charge of their own energy security assessment and safeguard; however, as pointed out by the European Commission, a key to improve energy security relies on a greater cooperation and a more collective approach, since national choices and decisions over energy markets, sources and infrastructure have immediate cross-EU security implications. At national level, the main electricity security actors are the TSOs, partly flanked by governmental/regulatory bodies. The TSOs have very detailed and complete dynamic and static models of the national transmission system under their responsibility and they are considered as the official owners of the related datasets. The further electricity modelling moves from grids towards market/energy systems, the larger the number of actors, including market operators, having a stake (in terms of data ownership) and playing a role (in terms of assessment perspectives). Electricity security models are used for supporting decision making across all the electricity security actions - operation, operational planning and scheduling, system planning, strategic energy planning. R&D actors frequently contribute to electricity security analyses and propose methodological improvements but they lack reliable data for their models. The whole range of electricity security analyses is conducted, both on reliability (operational security, flexibility, adequacy) aspects and vulnerability (resilience and robustness) aspects. Electricity models, from the time frame viewpoint, tend to be more and more combined or at least soft linked; probabilistic approaches (vs deterministic ones) are increasingly used - but their results are not necessarily embedded in the decision making process - for reliability analyses, whereas vulnerability analyses rely upon the most diversified (not always sophisticated) approaches. Areas for improvement at national scale include: following the best practices (e.g. UK) for model interlinking, including domains/subsystems/systems like: the electricity distribution grid, the gas system, the heat system etc; encouraging utilities to fully incorporate innovative approaches - as e.g. those based on advanced probabilistic/complex system techniques, generally proposed by the R&D community -, in the decision making process. At regional (cross-national) level, there are emerging actors - even though not fully formalised yet - performing electricity security analyses: particularly CORESO, the Pentalateral Energy Forum and other nascent regional operational initiatives. R&D actors are less active than at national and EU level as the regional scale represents a rather recent EU development. Electricity models are quite detailed and (compared to the national scale) better capture the cross-border aspects of the region under study. 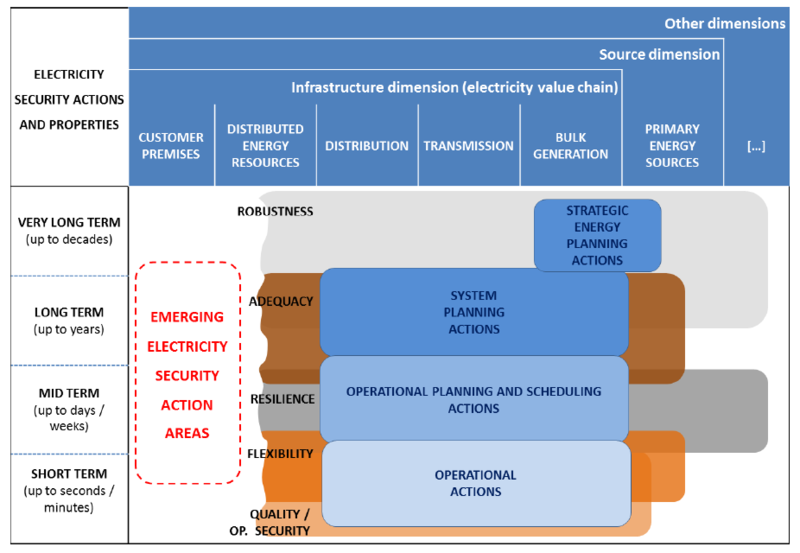 The electricity security models are used for supporting some of the electricity security actions: the focus is more on operational planning and scheduling actions and system planning actions (since operational actions and strategic energy planning actions are beyond the current remit of these regional bodies). As for the electricity security analyses, operational security, flexibility and adequacy analyses seem to have priority on resilience and robustness analyses. Time-wise, selected electricity security models are better linked and probabilistic approaches (vs deterministic ones) begin to be used for reliability analyses. Areas for improvement at regional scale include: better defining roles and responsibilities of the actors (so that the even accurate and innovative analyses can be used to support the decision making process), expanding security analyses in the vulnerability area and in modelling the interfaces with other energy systems. At EU level, the main actors are the ENTSO-E, ACER and the European Commission. ENTSO-E is tasked to perform EU-wide analysis and coordinated national/regional studies. ENTSO-E is progressing well in combining primarily static power system/grid models with power market/system models. Like explained above for the regional scale, the electricity security models are used for supporting decision making (especially) on operational planning and scheduling actions and system planning actions, (rather than) operational actions and strategic energy planning actions). In the scientific area, several R&D (FP7/H2020) projects are producing advanced models however with partially reliable datasets (if no formal agreement with the TSOs/ENTSO-E is in place). Probabilistic approaches (vs deterministic ones) begin to be proposed in the reliability assessment area, particularly for power system adequacy and flexibility. At this level, the visibility/observability of dynamics/issues occurring at regional/local level is however limited. Areas for improvement at EU level include a deeper assessment of issues occurring at the transmission-distribution interface, whereas first trials for interlinking gas and electricity models are ongoing, streamlining the modelling interactions and the assessment processes between the EU-wide and the regional scale, advancing the dynamic representation of the whole transmission system (e.g. via real-time simulation) targeting the emerging smart/super electricity systems challenges and tensions. 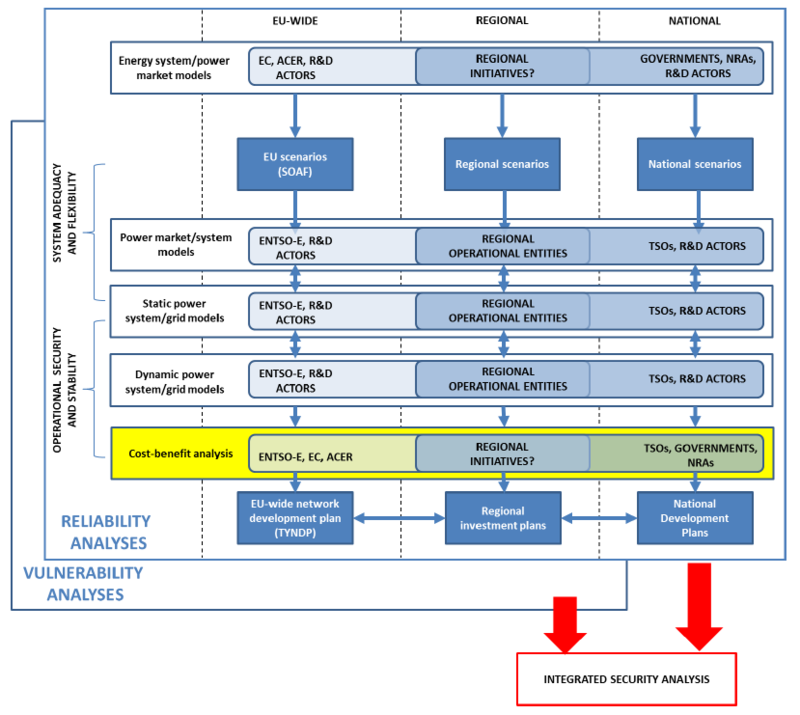 Elements of the current decision framework for electricity security analysis are depicted in the figure below, where the different spatial scales (EU, regional and national) and the main actors involved in reliability analyses for the planning phase are represented. This representation of course does not capture the whole spectrum of methodologies, actions and actors involved (as an example, aspects more linked to the real time system management are not fully covered by this case study as well as the analyses of the interfaces with the distributed/decentralised domains of the electricity value chain). In the current situation, one can distinguish two main parallel though interacting decision making processes: the one at the EU-wide scale and the one at the national level, where adequacy and operational security analyses are conducted. The interaction necessarily happens on the regional scale, through actors and via platforms which are only partly formalised and enforced. Thus, this interaction between the EU and the national scales cannot but be limited. 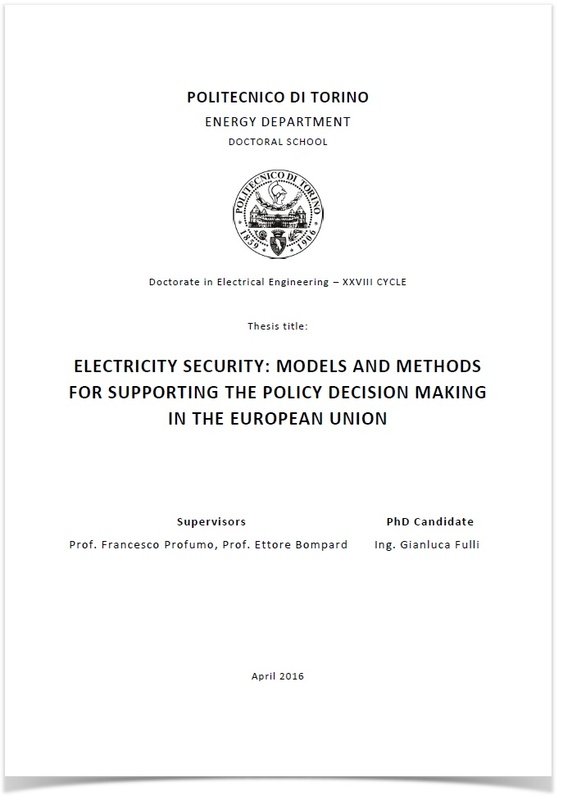 It has also to be noted that the security aspects represent just one of the perspectives considered in this electricity system analyses: equally important, the affordability and sustainability aspects are assessed - and possibly monetised - when performing cost-benefit analyses defining investment priorities. 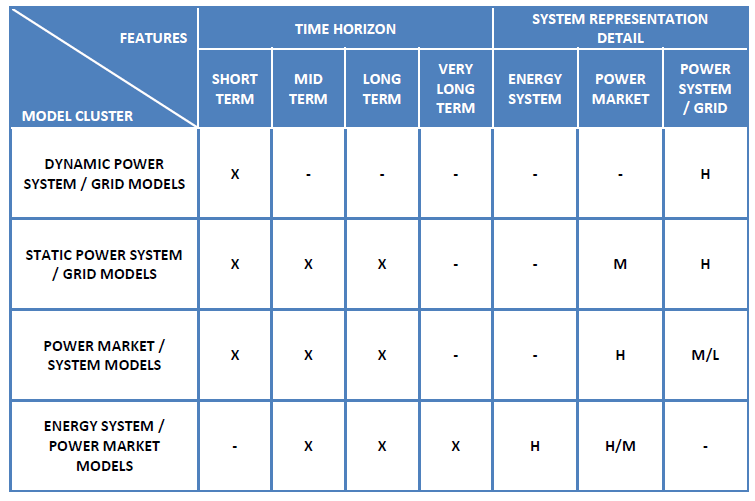 The models mostly deployed (from top to bottom) are energy system/power market models, power market/system models and static power system/grid models, since dynamic power system/grid models are currently rarely used in combination with the others for the reliability studies (e.g. the TYNDP does not include specific inputs from stability studies). Additionally, a crucial, overarching issue regards the interaction between science and policy in the electricity security sphere. As seen, specific electricity security models and analysis are pervasively embedded in the decision making process of power system industry, particularly in the operational and planning phases. The same, despite society heavily depends on electricity service provision, does not generally hold for the connections between scientific/technical electricity security analysis and the policy decision making process. There are several reasons for this disconnection: the political and scientific/engineering communities speak different languages; policy making is a mixture of politics, facts and values, whereas science primarily contributes to one of these, namely facts; technical results are often too complex to interpret and grasp, etc. However, as a paradox, even if politicians’ risk aversion can be generally considered high, not being aware or informed of the security implications of some policy decision may lead to security of supply deterioration rather than safeguard. 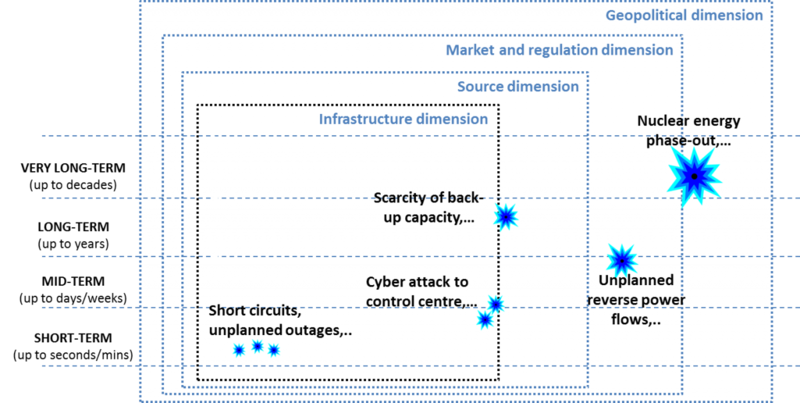 Most of the techno-economic challenges to electricity security have to do with the fact that electricity is not easily (or better, economically) storable; consequently, frequency and voltage, due to continuous changes both in demand and supply side, are constantly subject to variations in the electric power system. Keeping the transmission system secure and stable is a complex task. In order to avoid disruptions and wide-area disturbances, power flows should be kept within the thermal and stability limits of the transmission infrastructure while taking care of regulating frequency and voltages. Coping with variability when balancing supply and demand is not a new task (especially on the demand side), even though renewable power uptake significantly increases the imbalance correction challenges on the supply side. Short-term challenges. Power system security in this time frame critically depends from the interaction of a few stakeholders, in particular TSOs and DSOs and conventional and renewable generation companies; also residential, industrial and commercial consumers play a role, depending on the system/region under observation. The main technical challenges in this time frame can be summarised in the following ones: keeping the system stable following a perturbation, balancing generation and demand across the whole system taking into account generation and demand statistical variability and planned/unplanned system component outages. Mid-term challenges. Power system security in this time frame depends from the interaction of an expanding number of stakeholders including: wholesale and retail market actors; ENTSO-E; TSOs and DSOs; conventional and renewable generation companies; asset owners; aggregators (bringing together demand); residential, industrial and commercial consumers. In this time scale, while the system stability is not the first concern, the need for balancing generation and demand is still a primary challenge for the power system. Additionally, several risks of market failures emerge. Long-term challenges. Power system security in this time frame depends from the interaction of an even larger number (compared to the short- and mid-term) of stakeholders including: EU institutions and agencies, including the European Commission and the Agency for cooperation of Energy Regulators (ACER); national governments and institutions; National Regulatory Authorities (NRAs); wholesale and retail market actors; ENTSO-E; TSOs and DSOs; conventional and renewable generation companies; asset owners; aggregators; residential, industrial and commercial consumers. In this time scale, network planning and market design actions are expected to counteract the main security challenges. However, current electricity security performance and regulatory arrangements are largely a legacy of investments dating back to several decades ago. Ageing capacity needs to be replaced within a competitive market framework while also decarbonising the electricity sector. Very long-term challenges. Power system security in this time frame depends from the interaction of a multitude of stakeholders including: EU institutions and agencies, particularly ACER; national governments and institutions; National Regulatory Authorities (NRAs); wholesale and retail market operators; ENTSO-E; TSOs and DSOs; conventional and renewable generation companies; asset owners; aggregators; manufacturers; residential, industrial and commercial consumers; possible new actors not yet existing and/or conceived (offering new services and/or proposing new business models). Beyond the investment cycle, there are several challenges and strains affecting power system security, particularly in correlation with renewable energy deployment (primarily in terms of technologies, performances, and geographical siting); extension of the European electricity network towards neighbouring power grids; and the diffusion of distributed energy sources and self-consumption steering the development of a smarter power system. The following figure frames the electricity security actions which can be put in place to maintain/increase the previously introduced electricity security properties and with respect to the different domains of the electricity supply chain. Short-term system operation actions, including: transient/dynamic stability management, pre-fault and post-fault remedial actions (based on contingency analyses) and system balancing actions. Mid-term operational planning and scheduling actions, including forecasting, power scheduling, ancillary service procurement, outage coordination and asset management actions. Long-term system planning actions, including: system (network) optimisation, enhancement and expansion actions. Very long-term system planning actions, including: strategic energy planning/provision actions and a wide range of policy and regulatory initiatives which may impact not only the electricity system but the wider energy system (starting from the primary energy sources made available for electricity production). A structured platform for cooperative governance and decision making is crucial to ensure that electricity security objectives and actions are discussed, agreed and implemented in a transparent, effective and fair way. 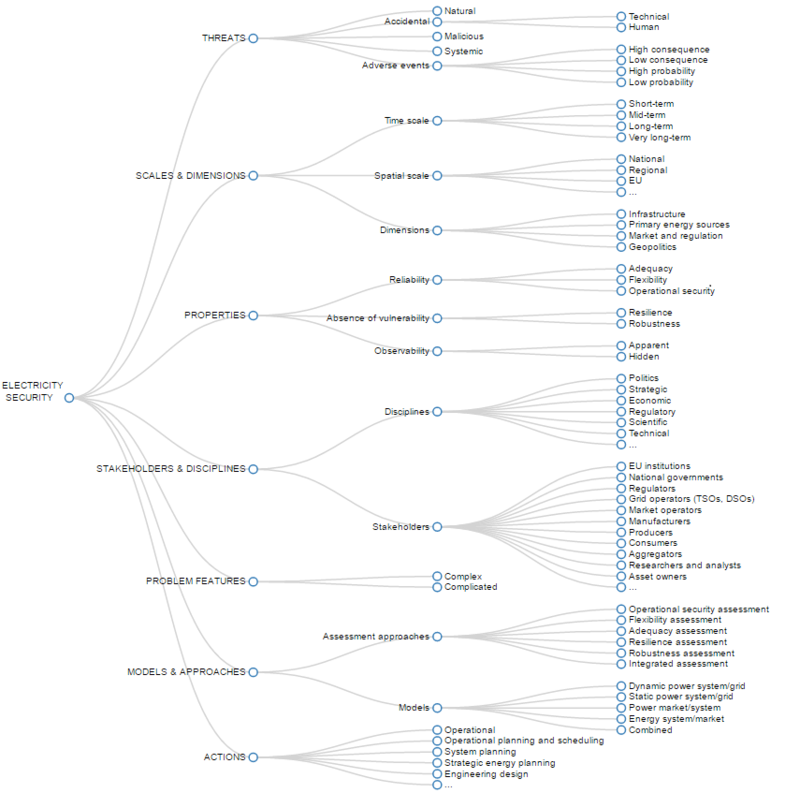 To his end, a novel decision-analytic framework is proposed, based upon elements and recommendations grouped in four macro-categories: governance, strategic, methodological and enabling categories. Multi-stakeholder platforms; Regional scale of decision making; Collaborative and integrated security analyses; Cooperative decision making mechanisms. Multi-stakeholder platforms, with proper governance and structured interaction mechanisms, should be further developed at all spatial scales - national, regional and pan-European - to perform joint assessments and carry out harmonised actions in the electricity security field. These platforms should be instrumental to bridge the local with the regional dimensions of electricity security and allow stakeholders developing and applying common assessment methodologies to discuss cross-cutting electricity security issues and solutions. Indeed, several tensions and strains are arising not only within the electricity (transmission) system but at its manifold interfaces (transmission-distribution, electricity-gas, ICT-physical system, etc. ), thus making the involvement of actors from the relevant sectors imperative. The regional scale of decision making should be fostered and streamlined. In the current geopolitical context, the regional scale appears as a strategic playing field where identifying synergies and reaching compromises between the EU and the Member States energy policy orientations. The current regional pilots offer valuable experience and lessons learned; still, harmonising the geographical/physical boundaries of the regions, considering the wealth and the variable geometry of the initiatives currently in place, is a prerequisite. Truly collaborative and integrated security analyses - again at wider geographical scale (than the traditional national one) - should be used to combine different aspects of security and include as many electricity security properties as feasible. They should take into account the different perspectives/interests of the electricity system stakeholders. By using a common framework and consistent evaluation methodologies, stakeholders can better compare studies and strategies and they can make the results understandable and replicable. Additionally, given the interdependence of the main energy policy objectives - security, affordability and sustainability - these integrated security analyses, even if focused on electricity security, should be framed in a wider energy and economic context. Assessing the socio-political-technical interactions linked to electricity security - so as to increase policy relevance of electricity systems models - might require shifting from solution analysis to solution discovery (heuristics) . Cooperative decision making mechanisms, steering the coordinated implementation of concerted actions stemming from the integrated security analyses, should be established. This would improve the overall electricity security performances, thanks to the stronger synergies and complementarities of balancing resources ranging from interconnectors, conventional/renewable generation capacity, storage and demand response. Even if the best spatial scale would be the EU-wide or continental one, since addressing security issues does not just entail solving technical problems but also letting several actors and decision makers interact effectively, it may turn out as more feasible - and less complex - to implement regional (cross-national) electricity security analyses-actions, also considering the evolving EU policy framework. A fully-functioning internal energy market requires that Member States coordinate and cooperate with their neighbours when developing their energy policies. Likewise, it needs to be assured that all regional initiatives evolve in a coherent way and lead to a fully-integrated energy market. Integrated coverage of all electricity security dimensions (infrastructure, sources, market and regulation, geopolitics), Smart/super grid and multi-energy carrier systems assessments, move from assessing flow security to assessing service security, emerging vulnerability assessment approaches based on complex network science, deeper interplay of complex network and engineering approaches. All the electricity security dimensions should be covered by the security assessment approaches: infrastructure, sources, market and regulation, and geopolitics. The electricity security assessment methodologies should be able to better observe and interpret the interactions of the electricity value chain system with the wider energy system and all the other surrounding dimensions. As an example, models should be able of representing the market signals that anticipate the lack of flexibility, such as the high prices in balancing markets as flexibility options become scarce. Smart/super grid and multi-energy carrier systems assessments should be intensified. Given the growing interdependences within the electricity domains (e.g. transmission and distribution) and between different energy systems (gas, heat, etc), electricity security aspects related to these interdependencies shall be studied. As an example, flexibility in wholesale electricity markets (including RES balancing) also requires efficient and well-integrated gas markets, which depend on, inter alia, balancing regimes, flexibility tools bundled capacity products at border points, and well-functioning secondary capacity markets and platforms. The modelling efforts in emerging areas - like distributed energy resources, end user's demand response - shall be boosted with the aim to integrate these aspects in wider national/regional models. On the same note, the modelling efforts and the electricity security analysis on super grids shall be interlinked with the modelling efforts on smart grids since major tensions are expected to develop at the interface between these emerging transmission and distribution systems. Additionally, the dynamics of demand-response, which are crucial in modern power system balancing, should be captured through other tailored models to obtain a finer time granularity and a better representation of the final consumers classes and communities. Electricity security analyses should move from assessing flow security to assessing service security. Smart grids promise to radically change the way power system is operated, designed and planned. Studying security of supply of smart grids is not only about interlinking transmission and distribution, but changing the prospective from electricity supply to electricity services. This shift could help identifying different means and pathways to achieve/safeguard security and identify different opportunities throughout the supply chain (e.g. linked to demand response). Emerging vulnerability assessment approaches - observing how the system might fail and increasingly based on complex network science - should be promoted further, also at the regional scale, to complement reliability assessment approaches - focusing more on how the system should work. Despite specific scenarios where the system exhibits poor resilience and robustness performances might be estimated to have small probabilities of occurrence, still they should be identified and considered by the decision-makers for the design and protection of critical infrastructures. As a matter of fact, vulnerability analyses could systematically explore the effects of failures and stresses in order to identify system weaknesses that may be exploited by, perhaps unknown or previously unimagined, threats or hazards. Since both complex network and engineering approaches have their distinguishing features and might be instrumental to assessing different aspects of electricity security, a deeper interplay between the two disciplines is recommended. Some of the most promising areas where complexity concepts applied to power systems have potential for developing sound scientific evidence are: power system evolution scenarios, smart grids, agent-based modelling and interdependent networks. Common definitions for flexibility, resilience and robustness; Cost-benefit analyses vs. multi-criteria analyses; Indicators used with care; Sensitivity analyses supporting security analyses; Soft/hard linking of electricity security models (Energy system/power market models, Power market/system models, Static power system/grid models and Dynamic power system/grid models); Flexibility as driver for modelling integration; Probabilistic approaches for reliability analyses. Policy makers and other stakeholders should propose and agree upon common definitions of crucial electricity security properties - particularly: flexibility, resilience and robustness - which (differently from other attributes like operational security and adequacy) are not consented at the EU level. Cost-benefit analyses should be preferred to multi-criteria analyses whenever viable. As all energy systems deliver some level of security, the primary objective for supply security policy is to strike the balance between the costs of improving security and the benefits from it. One of the main ambitions of the decision maker is to monetise and assess every aspect through cost-benefit analysis. However this approach can hardly be used when there is no thorough knowledge of the features (e.g. magnitude and probability) of the security threat, the outcome of the impact (e.g. severity) and options for a prevention policy . If this information is not available other methods may be used, such as indices or multi-criteria analyses, to support decision making under uncertainty. Multi-criteria analyses can be used to analyse both qualitative and quantitative aspects. If only quantitative data is evaluated, the ranking weights can be used to construct a complex indicator. Indicators should be used with care. Composite indicators, aggregating data - coming from model outputs and/or expert opinions - over time and/or space, are generally easier to communicate to and grasp for policy decision makers. However the aggregation might conceal and/or underestimate specific security properties - like the vulnerability of certain users, components or subsystems - and a single value makes it hard to grasp all the implications for security. Some indices rely on expert opinions to come up with weight factors, whereas others use the same weight factor for all indicators. However, the selection of criteria (e.g. choice of different indicators) and weight factors is usually not transparent or well explained. Additionally, the aggregation rules largely consider threats and other electricity security features as static. Sensitivity analyses should continuously support security analyses. Sources of insecurity can be dynamic and change over time but insecurities are in most studies seen as static and independent of the development of the energy system. An option for improvements could be to conduct subsequent valuations with more extensive sensitivity analyses, particularly of factors that are important for security of supply and assumed to be exogenous. Also crucial for validation, sensitivity analyses are needed in order to understand how initial assumptions and boundary conditions (e.g. on meteorological data, renewable energies development, etc.) influence the results of the models. Energy system/power market models, Power market/system models, Static power system/grid models and Dynamic power system/grid models would need to be utilised - and, depending on cases, soft or hard linked - in so far as they address complementary electricity security aspects and properties. It is fair to acknowledge that no model could aim at providing the full picture and the details needed to support the policy decision making. This does not mean that models are useless but that they have to be used with care, possibly combining outputs and results of models tailored to target different, complementary issues. However one single model cannot embed and describe all the electricity security aspects because the power system is multi-scale (in both space and time) and multi-physics, is highly nonlinear, and has both discrete and continuous behaviours. Using the models separately and independently may trigger the risks of adopting conflicting assumptions and promoting clashing solutions on how to increase the level of security. Finally, using multiple tools with the same dataset as input, though more time-consuming, improves the quality of the results since helps inputs/models debugging and results benchmarking. Flexibility should be increasingly used as driver for modelling integration in the reliability analysis area. As more and more renewable energy is in the system, balancing requirements should be analysed dynamically. One of the questions to answer is: provided that flexibility can be considered as a short-term dimension of adequacy, when/where one has to stop checking flexibility performances in the power system, then stepping into operational security/stability analyses? Since flexibility can be time-wise positioned between operational security and adequacy, its study not only requires a finer evaluation of adequacy aspects but is also bound to steer the integration of stability/operational security studies into the decision making/planning process. Flexibility in power systems is also inherently linked to the regulatory and market rules that help shape operations. An agreed-upon methodology to measure flexibility can help inform policy, assess needed changes to system operations, increase stakeholder acceptance of renewable energy targets, and increase investor confidence that the power system can integrate renewable energy without significant curtailments. Probabilistic approaches should complement and - in specific areas (e.g. flexibility and adequacy of power systems with high penetration of renewable energy sources in particular) - completely supplant the deterministic approaches when assessing reliability aspects of the electricity security problem. Reliability analyses - encompassing operational security and flexibility/adequacy analyses - provide crucial input to decision makers although they do not cover the whole spectrum of security events/aspects (even when based on probabilistic techniques). Geographic Information System and visual analytics; Supercomputers, real time simulators and parallel processing; Reliable and representative datasets. Advanced model-based and Geographic Information System (GIS)-based visual analytics should be extensively adopted to support the interactions with the policy makers while presenting, analysing and interpreting electricity security scenarios/results. Decision makers and analysts should take advantage of supercomputers, real time simulators and parallel processing to develop detailed, full-scale models of the power grids, and possibly make the high performance computing (HPC) technology available for real-time daily operations. These technologies would allow for more detailed and accurate system simulation and speed up the response to adverse situations, thus reducing the inability to prevent failures and enabling the integration of dynamic analysis into real-time grid operations. These technologies would be especially effective when combined to visual analytics. Reliable, representative datasets should be made available to analysts. Although most of the data generated in the electricity sector is viewed as proprietary, both because it includes sensitive industrial information about company operations and because it might be used for malicious purposes, producing and sharing representative, synthetic data that is sufficient to mirror real operations/performances could be the right compromise to consider (preliminary initiatives are already in place). 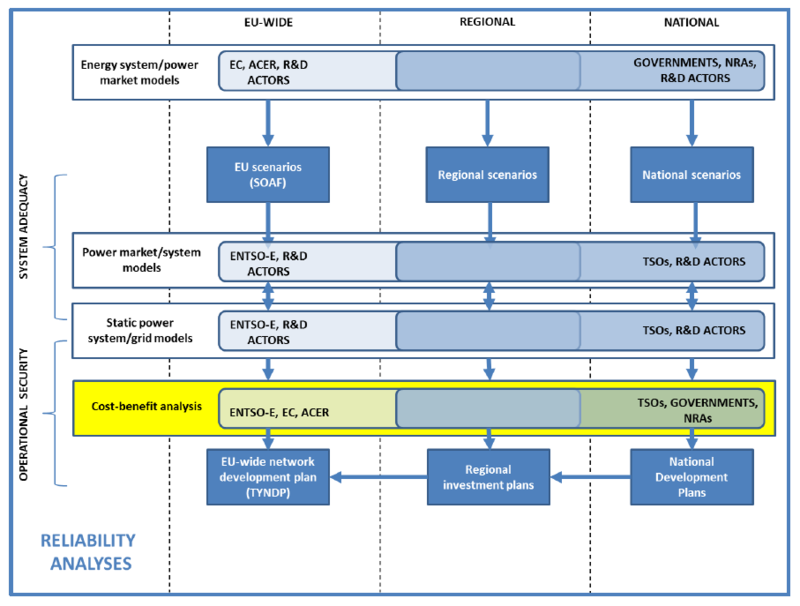 The novel conceptual framework for electricity security analyses - encompassing multiple actors, dimensions and models - is then contextualised in the European Union's power system planning process (see figure below), in order to show how it could better support the policy decision making on electricity security; reliability analyses and vulnerability analyses might be conducted, fundamentally by the same actors, on two different layers and combined through an integrated assessment approach. Looking deeper into the reliability analyses, one can see additional assessment blocks and models introduced. 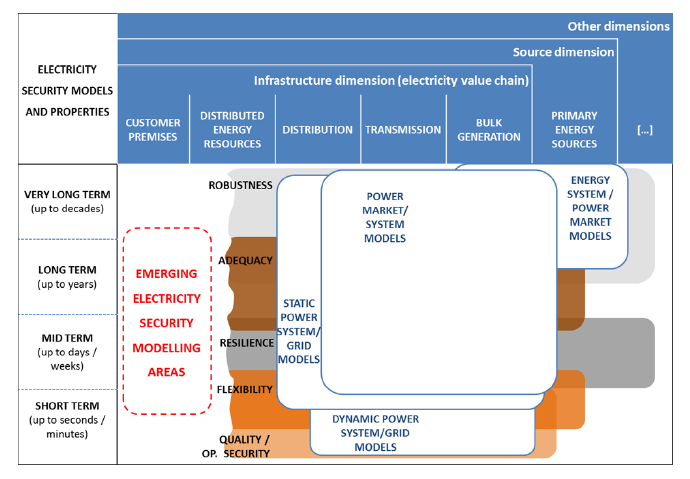 As for the models deployed (from top to bottom), along with the energy system/power market models, power market/system models and static power system/grid models already featuring in the previous framework, also dynamic power system/grid models are utilised for integrated reliability studies. The key point here is the need to study flexibility issues, which requires to go closer to real time to assess the system performances. This doctoral research was carried out in the context of the cooperation between Politecnico di Torino and the European Commission’s Joint Research Centre. The information and views set out in this publication are those of the author and do not necessarily reflect the official opinion of the European Union. Neither the European Union institutions and bodies nor any person acting on their behalf may be held responsible for the use which may be made of the information contained therein.